Copies of the Golden Record, sent journeying into deep space on the sides of the Voyager 1 and Voyager 2 probes in 1977, carries the sounds and music of Earth as well as a series of images to help characterize it. 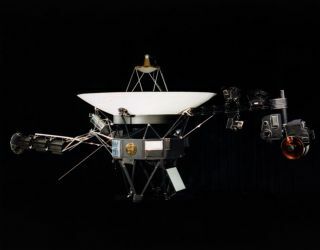 The Voyager 1 probe, which launched 40 years ago today (Sept. 5), is humankind's most distant physical emissary, at almost 13 billion miles (21 billion kilometers) from Earth. Voyager 1 and its sister-spacecraft, Voyager 2, which launched two weeks earlier in 1977, gave scientists their first close-up views of Jupiter, Saturn, Uranus and Neptune. And the spacecraft famously carried with them what could be aliens' first views of Earth, its inhabitants and their culture: copies of the Golden Record. The astronomer and science popularizer Carl Sagan curated the record selections, and it carried sounds and music from Earth as well as greetings in 55 languages. But the record also contains encoded photos seeking to teach aliens the mathematics — or really, the measurements — needed to understand humans' lives and their place in the universe. "And within that whole, there were substories," Lomberg added. "A story of how we eat, and a story of how we're born, and a story of how we travel. Also, there were some recurrent kinds of tutorial aspects." Part of that tutorial, Lomberg said, was pairing images with silhouettes that told nonhuman viewers which parts of the photos were significant, or even how to interpret perspective (that more distant images appeared smaller). And another was to build a sense of scale — of time, measurement and composition — to give the images context. "You always need the numbers to set scale," he told Space.com. The Golden Record's cover gave instructions for how to play it as well as a map of Earth's place in the galaxy. The Golden Record's cover, facing outward from where the record was placed on the two spacecraft's sides, gets straight to the point in depicting how the media is to be used — the top diagrams show how the record should be placed on its player and how images can be decoded from a certain portion of the disk. If decoded properly, the first image seen should be a circle. The two bottom-most images are more interesting. One is a map of Earth's location in space compared to 14 rapidly rotating, ultradense neutron stars the size of cities called pulsars; the dashes and lines along each encode how quickly the stars pulse with radiation (more on that code later). Pulsars, which can form when a dying star collapses, can serve as handy waypoints in space, because their rapid blinking can be extremely regular and distinctive. No matter where aliens are looking from, if they're close enough, they could triangulate the sun's location using its position relative to those pulsars. The second diagram is of the second-lowest and lowest energy states for a hydrogen atom. Hydrogen takes a specific amount of time to transition from one state to the other, producing a specific wavelength of light — both of which are used as basic units of measurement within the record. An explanation of the Golden Record's cover, complete with playing instructions. "A lot of people look at this — the cover diagram I made, for example, [on] how to play the record — and they can't figure it out in a couple of minutes, so they conclude that extraterrestrials will never be able to figure it out," Lomberg said. "Well, if we found something that was an artifact, we'd spend more than a few minutes, and we'd bring in people from all kinds of disciplines, because you don't know who's going to have the insight. If the spacecraft's alien interceptors understand the instructions to play the record, and therefore recover the sounds of Earth as well as the photos encoded at the end, the first image they would see would be a circle. This shape's there so the aliens can make sure their calibrations were correct and they're seeing the photos correctly. This Golden Record image shows a pulsar "map" to Earth and the Andromeda galaxy. Second, they'd see another view of that map from the record's cover, along with a photo of the Andromeda galaxy where one of the pulsars is located. Andromeda and its satellite galaxies' positioning tells viewers when, on a cosmic scale, the record was sent, Lomberg said. Physical aspects like the amount that the probe's nuclear battery has decayed could give aliens some understanding of how long it had been traveling. However, if visitors came upon the spacecraft after thousands or millions of years, the galaxy's configuration could provide a more long-lasting clue. Then, the record gets to the nitty-gritty: how to interpret numbers. An image on the Golden Record building up a binary and base 10 number system. The Golden Record committee chose to start by illustrating numbers in the simplest way — a number of dots, which the aliens should be able to count in any number system. Then, the record equates those values with numbers written in binary as well as base 10, which is our ordinary number system. Binary writes every number using powers of two. In the Golden Record's version, a vertical line fills in for "1" and a horizontal line for "0" — 5 is represented as "| – |," which comes out to (1 x 2^2) + (0 x 2^1) + (1 x 2^0) = 4 + 0 + 1 = 5. As numbers get longer, binary representations quickly grow unwieldy — look at "| | | | – | – – –" for 1,000, the largest number shown on the image. The diagram then goes on to show how our number system works: adding, multiplying and denoting fractions. While astronomer Frank Drake, who masterminded the images' addition to the record, had experience considering how to communicate with extraterrestrial intelligence, its exact implementation here was done very quickly, according to Lomberg. The Golden Record came together at a frenetic pace. "The background of this, of course, is that the whole project took six weeks," Lomberg said. "From the time I got the phone call to the time we had to send our finished design [of the Golden Record] out to be fabricated was six weeks. So, we didn't have a heck of a lot of time to really have thorough discussions and explore alternatives; it was very much shoot from the hip. A diagram from the Golden Record uses a change in hydrogen's energy state to define units of time, distance and mass. Now, back to those hydrogen atoms, seen at the top left of this next diagram. Atomic hydrogen has one proton and one electron, and each of those components can have a particular spin. When the two are spinning in the same direction, the atom has slightly more energy than when they spin in opposite directions, so the electron will eventually flip to that configuration, releasing radiation. That radiation is a particular wavelength of light 21 centimeters (8.3 inches) long, detectable coming from wherever hydrogen gas congregates in space. So, the most common element in the universe, combined with a signature wavelength of light it releases, offered the Golden Record's designers a valuable chance to build up a measurement system. You can see the hydrogen atom with its electron and proton spinning in one configuration, then the other, in the diagram at the top. From there, the image derives 1 M (the weight of an atom of hydrogen) and 1 ↑ (the time it takes for that electron flip). The image converts M to grams, kilograms and "e" (based on Earth's mass) and converts the time measurement to seconds, days and years. Then, on the right, the image uses the wavelength — 21 cm — released by the flip to explain centimeters, angstroms, meters and kilometers. Distance, diameter, mass compared to Earth and orbital period of the sun and solar system planets. Those units come in handy soon afterward, because the record next goes through the sun and the solar system planets to give their diameters, distance from the sun, mass compared to Earth (using the "e" unit from before) and how long each planet takes to complete a full rotation, compared to an Earth day. The rest of the planets and their distances from the sun, diameters, mass compared to Earth and rotation time, in days. All that established, the record's framers can get into the good stuff — images of the planets, with their sizes and masses, the proportions of different elements and the key ingredients to life on Earth (shown as atoms and molecules) and even how DNA is built. Chemical definitions of elements and compounds key to life. The viewer is plunged into a deeper look at humanity — how our bodies are built, how babies form, the many cultures on Earth and activities that fill people's lives. Throughout, diagrams provide the sizes and durations of what's depicted.Another key element the measurements could add to photos was a sense of time, Lomberg said. "How long does it take for a certain activity to happen? How long does it take to form a baby, to do a routine on a balance beam, to grow and die? How old do people live to be? It gave a fuller picture of human life by being able to include things like that as well." Lomberg is currently spearheading a project to upload a "Golden Record 2.0" to the hard drive of the New Horizons probe, which flew by Pluto in 2015 and is the farthest-traveling probe after the Voyager duo. On the crowdfunding site Kickstarter, he's raising money to build a platform for people to submit photos, sound and more to fill that record. On that project, like with the Golden Record, the main goal is providing a view of humanity to two audiences: extraterrestrials, and humans themselves. The structure and chemical makeup of Earth's interior (denoted by chemical element number and what fraction it makes up in each region). This article's discussion focuses on the measurements and diagrams on the Golden Record, but the key goal of the audio and photographic parts was always to convey the less directly measurable aspects of human life and society, Lomberg said. "The spacecraft itself tells a lot about our engineering and technology; you want the record to tell about the rest of us — the other parts of being human," Lomberg said. The measure of Earth, as shown on the Golden Record.